I love how the producers were able to bring the Bible alive. We watched this as a family and just loved it. Of course they took artistic license in some parts, as nothing other than the actual Word is without error. I loved that the kids could watch it and see how exciting the Bible really was. The history is so rich, and such a central part of our lives personally. This is one of the best mini series we have watched! 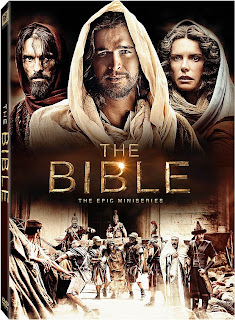 From Executive Producers Mark Burnett (The Voice, Survivor) and Roma Downey (Touched by an Angel) comes THE BIBLE — an epic 10-hour miniseries debuting on History® March 3, and coming to Blu-ray, DVD and Digital HD April 2 from Twentieth Century Fox Home Entertainment. Featuring hours of never before seen behind-the-scenes footage and making-of featurettes in a stunning high bit rate HD transfer and immersive 5.1 audio, THE BIBLE is the must-own Blu-ray and DVD event of the year. The Blu-ray and DVD exclusively feature an all-new cut of the miniseries featuring more of the stories you know in ways you’ve never seen. Breathtaking in scope and scale, THE BIBLE features powerful performances, exotic locales and dazzling visual effects that breathe spectacular life into the dramatic tales of faith and courage from Genesis through Revelation. This historic television event is sure to entertain and inspire millions across the globe. Narrated by Emmy® winning actor Keith David, THE BIBLE features a stunning international cast including Portuguese actor, Diogo Morgado as Jesus Christ and beloved actress, Roma Downey as Mother Mary. And for the first time since their award winning collaboration on Gladiator, Oscar® and Grammy® winning composer Hans Zimmer reunites with acclaimed vocalist Lisa Gerrard to create the majestic musical backdrop for this epic production. The four-disc Blu-ray and DVD set dives deeper into the making of the series and features a behind-the-scenes look at how the groundbreaking docudrama came together. Interviews with producers, directors, and cast illustrate creative collaboration on-set and off and show how the remarkable Moroccan scenery was transformed into the world of the Bible. THE BIBLE series is produced for HISTORY by Lightworkers Media and Hearst Entertainment & Syndication. Executive Producers are Roma Downey, Mark Burnett and Richard Bedser. Executive Producers for HISTORY are Dirk Hoogstra and Julian P. Hobbs. Twentieth Century Fox Home Entertainment, LLC (TCFHE) is a recognized global industry leader and a subsidiary of Twentieth Century Fox Film, a News Corporation company. Representing over 75 years of innovative and award-winning filmmaking from Twentieth Century Fox, TCFHE is the worldwide marketing, sales and distribution company for all Fox film and television programming, acquisitions and original productions as well as all third party distribution partners on DVD, Blu-ray™, Digital Copy, Digital HD™, and VOD (video-on-demand). Each year TCFHE introduces hundreds of new and newly enhanced products, which it services to retail outlets from mass merchants and warehouse clubs to specialty stores and e-commerce throughout the world. A celebrated, Emmy® nominated actress Roma Downey is best known for her nine seasons as the tender-hearted angel on the hit CBS show Touched by an Angel. Ms. Downey starred in over 200 episodes and her work as the compassionate angel inspired millions of people around the world and earned Ms. Downey multiple best actress nominations for Emmy® and Golden Globe® awards. Born in Ireland and classically trained in London, Ms. Downey has performed on stage with the famed Abbey Theatre Company and has appeared both on and off Broadway. She played the leading role of Jackie Kennedy Onassis in the Emmy® award winning six hour miniseries for NBC called “A Woman Named Jackie." Ms. Downey not only starred in, but executive produced seven television movies for The CBS network, among them "Borrowed Hearts" with Eric McCormack and "Second Honeymoon" with Tim Matheson. She is the executive producer of the children's DVD and book series "Little Angels" and its companion "Little Angels Storybook Bible". Ms. Downey and Mr. Burnett have co-authored a companion book to the series ‘A Story of God and all of Us.’ The book is available now from Faith Words. For many years Ms. Downey has been a spokesperson for "Operation Smile" a volunteer organization that brings free surgeries to children around the globe with facial deformities. She has travelled to third world and developing countries making fund raising films on their behalf. Three time Emmy Award winner Mark Burnett has produced over 1,000 hours of television programming which regularly air in over 70 countries worldwide. His current network series include "The Voice" (NBC), "Survivor" (CBS), "The Celebrity Apprentice" (NBC), "Are You Smarter Than A Fifth Grader?” (FOX), “Shark Tank” (ABC) and “Expedition Impossible” (ABC). Burnett is one of very few producers to have had a renewed series on each of the four major networks. He also has a strong presence in award show franchises, producing the annual “People’s Choice Awards” and the “MTV Movie Awards" and for the first time in 2011 is producing the 63rd annual Academy of Television Arts and Sciences "Primetime Emmy Awards." In April of 2011, Burnett and media conglomerate Hearst Corporation announced their new joint media, production and events-based venture which will focus on media content, producing events around that content, and spinning off television shows and other programming based on Hearst brands. Mr. Burnett has been named one of the world's most influential people by TIME Magazine and also TV Guide’s most valuable player. He has won BRANDWEEK’S Marketer of the Year Award, The Brandon Tartikoff Legacy Award, the PGA Norman Lear Award and the prestigious ROSE D’OR FRAPA Format Award. Burnett was inducted into the Broadcasting and Cable Hall of Fame and was honored in 2010 with a star on Hollywood's Walk of Fame. I really enjoyed watching this, and I think I'll have to get my own copy. The special features look interesting, especially the visual effects featurette. Photo Ready Giveaway.. Bloggers Wanted!! Is your EGO right for leading your family? Is your Athlete at Risk for sudden heart failure?